One of my favorite times of year to wear incense perfumes is during Indian Summer — when days are hot and nights are chilly. Light and soft incense perfumes fit perfectly with the scents of dry leaves and the lingering aromas of smoke from neighborhood fireplaces. Though I appreciate many Byredo fragrances (I love Pulp), I missed Encens Chembur's debut nine years ago. The perfume is named after a suburb of Mumbai (these days, Chembur has lost its 'country' vibe and is one of the most polluted places in India due to heavy industry). But there is no corruption or "pollution" in Encens Chembur; it's a lovely perfume. When I first sniffed Encens Chembur, I realized a more recent favorite fragrance — Etat Libre d'Orange Attaquer Le Soleil Marquis de Sade — smells like it (Encens Chembur was released eight years earlier). Both perfumes build their structure around beautiful cistus labdanum (Cistus ladanifer). In both perfumes, cistus labdanum is lightened by citrus aromas. Though Encens Chembur is mostly linear in character, I do notice some ginger in the top notes and incense-y elemi in mid-development. If you've been considering buying either Atttaquer Le Soleil Marquis de Sade or Encens Chembur, I'd say Encens Chembur is easier to wear: it has less of a musky/overripe edge. I'd recommend doing a side-by-side comparison before purchasing. I want one or the other but can't make up my mind! 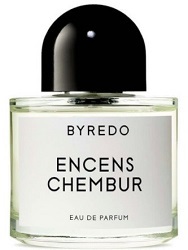 Byredo Encens Chembur was developed by perfumer Jérôme Epinette, and has listed notes of lemon, bergamot, ginger, temple incense, nutmeg, cistus labdanum, amber and musk. It is available in 50 ($150) or 100 ($230) ml Eau de Parfum. A coffret of three 12 ml travel sprays is $110. For buying information, see the listing for Byredo under Perfume Houses. 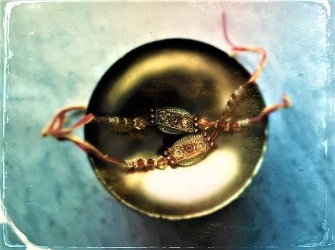 Note: top image of shows rakhi bracelets in a gold bowl, and is by the author. I haven’t smelled this one since it was called simply Chambur, but I remember it being the only one of the original releases I liked. Time to revisit it I think. Des esseintes, I just revisited Pulp and it smells the same…whew! When Byredo first launched, I liked Gypsy Water and Pulp, but then I wasn’t too interested in the brand for a while…until I looped back, about 2 years ago, and now Rose Noir is one of my most-worn fragrances. I’m fond of some other recent additions to the line, too. J, it’s nice…I need to try Rose Noir. I love that u love Pulp! Kevin, thanks for the review. I wasn’t too thrilled with Byredo when they first launched, but I may need to revisit the line now. Encens Chembur sounds awfully nice. And like you, I enjoy wearing light incense frags in the hot weather. AnnE, smoke and ash have been in Seattle’s air on and off this summer…incense atmosphere! I love the idea of incense fragrances, and I’ve tried many that I sort of like without finding exactly what I want. As you note, so many disappoint because of certain overbearing notes. This one sounds worth a try. FYI, Unum LAVS smells absolutely perfect on a friend of mine, but too austere on me. Did you ever have a chance to try his Io Non Ho Mani Che Mi Accarezzino Il Volto? Agree with your comment on vanilla. I so wish perfume makers would stop putting it in f&%$@#! everything. No matter its concentration, it quickly turns dominant and cloying on my skin. Surely there are other options, besides vanilla, amber (also sickening), and so on, to provide warmth to a scent. And why must everything be “warm” anyway? I’d rather hear about a perfume that’s nine-legged, orthogonal, schwifty, or whatever — really just about anything without sludgy moods and feelings or identity fantasies. Michael…people make fun of oud, but give me a dash of oud instead of the vanilla extract I smell all the time! Oh I’ll have to check this one out. A lot of the Byredo’s have some similar thing in them that makes me a little queasy. It’s utterly absent in the delightful Pulp and perhaps also here! Thanks for the review, as always. I have heard that some people complaining about the longevity and sillage isn’t that strong? (I know it’s not a powerhouse fragrance..but does it disappear after an hour or so? Littlec, oh…it lasts at least 6 hours on me, but I’m not a 2-spray guy! Late to the party but thanks for the review on this one, Kevin! I love this one and basically wear it three seasons. In summer, my husband hates it but come fall, I’ll wear it and he’ll ask what smells so good! ??? ?